The Doge's Palace was first built in the 13th century, but only in 1339 did it become the seat of Genoa's first Doge, Simon Boccanegra. The building has then been enlarged and modified many times throughout the centuries (also due to a fire and to bombardments during World War II), so that today the original medieval structure is hardly visible. The Palace is now one of the most important museum centres in Genoa, with its many temporary exhibitions exploring classical, modern and contemporary art. The museum opened in 2004 during the year with "Genoa Capital of Culture" and it's located inside the D'Albertis Castle, on Montegalletto hill. Captain D'Alberti was both a traveller and a writer who traveled all his life, first with the Military Navy, then in the Merchant Navy and in the end yachting (he founded the first Italian Yacht Club in 1879). During his travels (three times around the world and one circumnavigation of Africa) he collected many souvenirs from people he met, now exhibited in the World Culture Museum. When in 1932 he died, he donated the castle and his collections to Genoa Municipality. 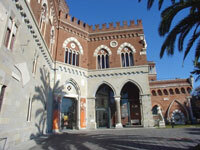 It is the largest museum about the sea in the Mediterranean region. Visiting the MUMA, you will be involved in the sea world, tasting the life you could live on ships, thanks to a fiel and scientific reconstruction of the epoch. The White Palace was built between 1530 and 1540 by Luca Grimaldi; it belongs to one of the most important Genoan families and it was donated in 1899 by Maria Brignole Sale, Duchess of Galliera, to the city of Genoa. The Gallery contains many European paintings, aged between 13th and 18th centuries. You can see Italian authors, such as Barnaba da Modena, Ludovico Brea, Luca Cambiaso; Paolo Caliari (il Veronese) and Filippino Lippi, but also Flemish, French and Spanish, including Pieter Paul Rubens, Antoon Van Dyck, Francisco de Zurbaran, Bartolomè Esteban Murillo and Jose de Ribera masterpieces. Among the Genoan painters, you can find Grechetto, Bernardo Strozzi, Valerio Castello, Domenico Piola with his sons Anton Maria and Paolo Gerolamo, Gregorio De Ferrari, Alessandro Magnasco. Located in the centre of Genoa, it's one of the most important Pictures Galleries in Genoa. The Palace, designed by the Architect Pietro Antonio Corradi between 1671 and 1677, it's today recognized as a Human Patrimony from UNESCO. Like the White Palace, it was donated by Maria Brignole Sale, duchess of Galliera, to the city of Genoa, in order to let it become a public museum. The collections consist of paintings of the Flemish school, created by Guido Reni, Guercino, Mattia Preti, Bernardo Strozzi, Veronese, and a textile collection from different countries, a topographic and cartographic collection. 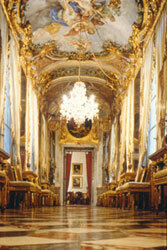 The Gallery is inside the Palace of Doria Tursi (or Niccolò Grimaldi Palace), which is the Genoa Municipality seat, and is dedicated to the most important Genoan musician and composer: Niccolo Paganini. Among the historical relics preserved in the Gallery you can find: the urn with Columbus ashes and the Niccolò Paganini's violin: the "Canone", that is played once a year. In addition, some beautiful collection of coins, weights and official measures of the ancient Republic of Genoa. med 'Canone', it is played just once a year. 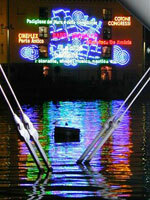 The Museum of Water and Gas in Genoa is the project of the AMGA Foundation. It was built in order to show the history of gas and water system in Genoa. There are four sections: history archives, library, several photographs and exhibits. Thanks to many different expeditions and researches made by the Italian scientists in the Antarctic continent, The National Museum of Antarctic can offer its visitors important biological, geological and paleontological collections. The museum is called Felice Ippolito to pay honor to its first director. Museum of Etnomedicine "Antonio Scarpa"
This is an interesting museum that shows us different medical traditions all over the world. There are about 1,500 objects, instruments, texts that Antonio Scarpa collected during his travels. It's one of the few museums of this kind in the whole Europe. 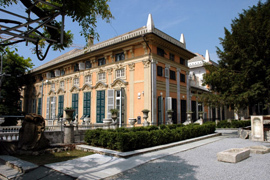 The Museum is situated out of the center of Genoa, in the area called Pegli, in a beautiful Villa Pallavicini. It will take you on a trip in far, far away past of Liguria. From the relics of the giant bears and other animals which lived in the last period of the Glacial Era to the remains of the Romans, Paleolithic burials and graves of the ancient Genoese inhabitants make this museum a very interesting destination to visit. The Museum of the Oriental Art Edoardo Chiossone in Genoa is the most important museum on its kind in Italy. The painter Chiossone, native of the province of Genoa who lived many years in Japan, left his large collection counting over 15,000 pieces of Oriental art to the Museum. It contains magnificent armours, weapons, Chinese and Japanese bronze, ceramics, beautiful textiles, theatre masks and many other things. The Museum "Museo Biblioteca dell’Attore" was founded in 1966 as a part of the Teatro Stabile of Genoa, in order to store theatre books, pictures, relics of the rich Salvini family. The purpose of the museum is the historical and critical study of theatre, scene art and conditions of Italian actors from the beginnings of the 18th century until nowadays. The library focuses on drama theatre, costumes and cinema. 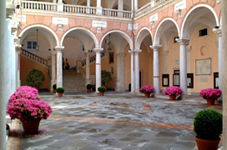 The diocesan museum in Genoa is placed in the XII century cloister of the San Lorenzo Cathedral. The museum is characteristic for its art that shows different events of the Genoese Church. The Museum of the History of Genoa Football Team is a modern museum dedicated to the history of the famous Cricket and Football Club. It's opened thanks to the Foundation Genoa 1893, the organization that represents the interests of supporters of Genoa. The museum has a great collection of photographs showing the club changing through the years. The Italian Jazz Institute was born in 2000 out of the Louisiana Jazz Club. Organized as the center for documentation and research, it's the only institute of that kind in Italy. It offers you a guided research of discography, compilation of anthologies for studying purpose video projection and many more. The Accademia Ligustica di Belle Arti was founded in 1751 in Genoa by the group of artists and aristocrats who collaborated with Francesco Doria. It's placed in the palace projected by the architect Carlo Barabino. The rich collection of paintings, drawings, marble and bronze sculptures is arranged in 10 different halls and it opened to the public only in 1980, when the Museum was inaugurated. It's interesting how this gate got its name thanks to an error of pronunciation. The original name was "Cibaria" but while the centuries were passing by, it changed its name into "Siberia". The Siberia gate is the only one remained in Genoa from the 16th and 17th centuries. For decades it stayed almost forgotten and uncared for, but in 2001 thanks to the Porto Antico Society and the project made by Renzo Piano, it was rearranged and renewed into a space for exhibitions. Emanuele Luzzati Museum now lives inside this gate and proudly shows to its visitors the work of this interesting Genoese architect. Famous set designers and illustrators collaborated with many international directors, architects and writers. The "Magazzini dell’Abbondanza" was founded by the Republic of Genoa to place goods during the period of abundance and share them out when the time of need comes. Nowadays the building of the Storehouse of the Abundance is the Center for the formation of the University of Genoa. The building is from the 16th century and is placed in the Porto Antico (Ancient Harbor) area. Il Padiglione del Mare e della Navigazione (Pavilion of the Sea and Navigation) is a real time travel museum situated in the beautiful area of Porto Antico in Genoa. The museum takes its visitors through history showing the reconstructions of ancient Genoese piers, decks, battles and transatlantic ships. The interesting atmosphere is accompanied by the wave rumors, voices of sailors, echoes,etc. The Museum of the Risorgimento is situated in a 15th century house, Palace Adorno, where Giuseppe Mazzini was born. It is very modernly organized on 3 floors in 14 halls and with its flags, paintings, photographs, books, weapons and armor authentically testifies about the lives of the most important figures of the Risorgimento, like Giuseppe Mazzini himself, Giuseppe Garibaldi, Goffredo Mameli, all of them coming from Genoa. For a port-city like Genoa, the Naval Museum is very important. It conserves a long history and culture of the Genoese sailors. The marine collection goes from 11th to 16th century and it shows all the changes made through the time in the port of Genoa, a lot of marine maps, very important treasure at the time, iconographies and different foreign objects. 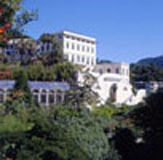 It is hosted by a splendid Renaissance Villa Doria since 1930. One of the most beautiful and authentic Genoese palaces is surely Villa del Principe. It was built in 1530 for the admiral Andrea Doria. It's the only royal palace that the Republic of Genoa admitted in its long history. The palace offers you a magnificent walk through the 16th and 17th centuries. The artist Perin del Vaga decorated the palace for Andrea Doria with many beautiful frescoes with mythological themes. The inside walk takes you through the prince's and princess' apartments and extraordinary large halls, all carefully decorated. Once you've finished the inside tour, you can enjoy the beauty of the prince's great garden with seaside view, fountains and an artificial cave from the 16th century. The cave became a part of the splendid garden in 1603. Today, if you'd like to visit the cave you need to make an appointment, because it's not included in the standard tour. The Spinola Palace is a historical building situated in the heart of Genoa. It is also called The Francesco Grimaldi's Palace by its edificator. Through history, this was the home of the Grimaldi, Pallavicino, Doria and Spinola families who finally donated it in 1958 to the Italian State. Now, the building is The National Gallery of The Spinola Palace and it offers to its visitors a tour in the past showing collections of paintings, furniture, ceramics, silver, books and other private treasures of belonging to all the families that lived here in the past. The palace became an UNESCO World Heritage building in 2006. The Royal Palace is one of the major historical buildings in Genoa. The gallery of the Royal Palace is a museum-residence which preserves the spirit of the home of the Balbi, Durazzo and Savoia families who lived there. All the furniture, the paintings and different house objects are authentic. In 1919, it becomes part of the State patrimony, which made it a beautiful museum. -The first floor is occupied by the apartment of the Duke of the Abruzzi; it's a wonderful prince's suite with 18th century decorations. -The second floor contains: the Mirror gallery (probably the main characteristic of the palace restructured by Domenico Parodi); the Throne hall (the throne is made out of wood and gold, the whole room is full of red velvet with a tall canopy); the hall of time (the galley with paintings of some famous Italian artists like Tintoretto, Bassano, Piola, Vassallo, Grechetto). In 2006, this palace became an UNESCO World Heritage and is enlisted as a palace of the Rolli of Genoa, public lodging palaces and mansions of eminent Genoese families, which aspired to host people in transit for visitng the state. This museum is situated in a reconstructed Agostinian convent dating back to the 13th century. There are about 4,000 beautiful examples of marble, wood and metal sculptures from the 13th and 18th centuries. The museum proudly represents pieces of some great artists as Antonio Canova, Nicola Pisano, Parodi, Pierre Peuget, Francsco Maria Schiaffino, Luca Cambiaso, Domenico Piola and others. As the name of the museum suggests, the founder and for over 40 years director, was the famous Ligurian naturalist, politician and senator of the Kingdom of Italy, Giacomo Doria. The museum had its first residence in Villetta Dinegro, but in the early 1900 had to move to its current address in a much larger building in order to make space for a new naturalistic treasure that was constantly coming. Different scientists brought millions of examples of new animal and vegetal species in alcohol from their expeditions in still not explored regions of the Planet. The museum became "National Museum of Insects" for its rich and precious collection. Unfortunately, after the 2ndI World War destructions, the museum lost that title. Since 1922, the museum is the official seat of the Entomological Italian Society. 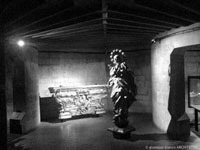 The Museum of the Treasure is situated in the underground corridors and halls of the San Lorenzo Cathedral (St. Lorence Cathedral). The Cathedral started to collect its treasures since the 12th century. In the years to come the collection was massively growing thanks to official and private donations. It was officially opened as the museum in 1892 in the occasion of the 400th anniversary of the discovery of America. 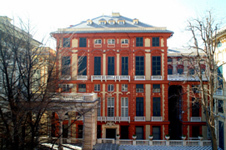 The elegant 20th century neoclassical villa is the seat of the Museum of Contemporary Art. A beautiful park with a seaside view surrounds the villa. It is opened to the public and during summertime there is also an open cinema. The villa was donated to the municipality of Genoa by the Croce family exactly for the purpose to transform it into a museum. It was inaugurated in 1985 and contains modern paintings, sculptures, photographs and much more.